Russian statesman; born 1832. He was one of the prime movers in the reactionary anti-Jewish legislation of the last quarter of the nineteenth century, the alleged instigator of the anti-Jewish riots, and the author of the notorious May Laws. On the assassination of Alexander II. 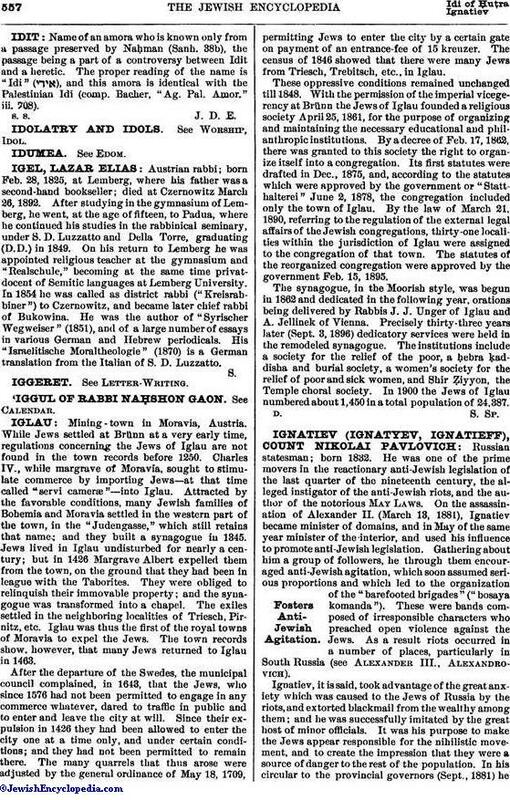 (March 13, 1881), Ignatiev became minister of domains, and in May of the same year minister of the interior, and used his influence to promote anti-Jewish legislation. Gathering about him a group of followers, he through them encouraged anti-Jewish agitation, which soon assumed serious proportions and which led to the organization of the "barefooted brigades" ("bosaya komanda"). These were bands composed of irresponsible characters who preached open violence against the Jews. As a result riots occurred in a number of places, particularly in South Russia (see Alexander III., Alexandrovich). Ignatiev, it is said, took advantage of the great anxiety which was caused to the Jews of Russia by the riots, and extorted blackmail from the wealthy among them; and he was successfully imitated by the great host of minor officials. It was his purpose to make the Jews appear responsible for the nihilistic movement, and to create the impression that they were a source of danger to the rest of the population. In his circular to the provincial governors (Sept., 1881) hestated: "While protecting the Jews against violence, the government recognizes the need of equally vigorous measures for changing the existing abnormal relations between the Jews and the native population, and for protecting the people from that injurious activity of the Jews which has been the real cause of the agitation." The anti-Jewish movement continued while an inquiry was being made by a commission appointed by the czar in response to a petition from the Jews of St. Petersburg. Fresh outbreaks occurred; and there is abundant proof that the riots were prearranged. They could not have taken place had an earnest effort been made to prevent them. This is evidenced by the fact that order was maintained without difficulty in the provinces where the governors were not adherents or followers of Ignatiev, e.g., in Wilna. On May 15, 1882, with the sanction of the czar, Ignatiev issued what are known as the May Laws, he having availed himself of the state provision applicable to cases of emergency, since the opposition to the enactment of the laws was too great to permit of their passage as permanent measures. It has been stated that Ignatiev offered to exempt the Jews of St. Petersburg from the ukase on the payment of a large sum of money; but while he may have secured large sums from individuals, he was not successful in obtaining any from the community generally. 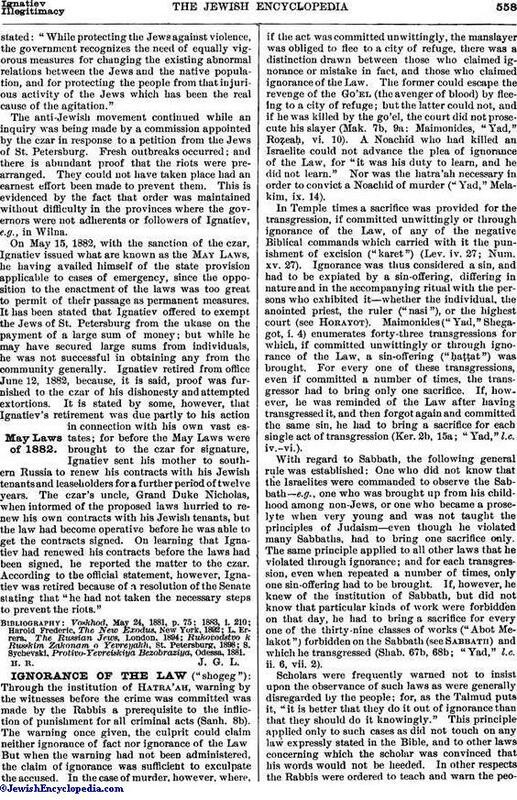 Ignatiev retired from office June 12, 1882, because, it is said, proof was furnished to the czar of his dishonesty and attempted extortions. It is stated by some, however, that Ignatiev's retirement was due partly to his action in connection with his own vast estates; for before the May Laws were brought to the czar for signature, Ignatiev sent his mother to southern Russia to renew his contracts with his Jewish tenants and leaseholders for a further period of twelve years. The czar's uncle, Grand Duke Nicholas, when informed of the proposed laws hurried to renew his own contracts with his Jewish tenants, but the law had become operative before he was able to get the contracts signed. On learning that Ignatiev had renewed his contracts before the laws had been signed, he reported the matter to the czar. According to the official statement, however, Ignatiev was retired because of a resolution of the Senate stating that "he had not taken the necessary steps to prevent the riots." S. Sychevski, Protivo-Yevreiskiya Bezobraziya, Odessa, 1881.